I do try to walk as much as I can even though I was loth to leave my library book. I had to go for the bread order in the village so I left my car in the square & walked round the block, it took me around an hour & over 7,000 steps so I feel I have earned my meal out tonight somewhat! These cows were very nosy & came to the gate for a chat. I think the berries in the hedgerow are sloes but would love for someone to tell me definitely. I am unsure as I thought sloes were bigger but I have looked on google & cant see anything else they could be. Just in the hedgerow growing with some red berries too. Out tonight so no need to comment on mine here. Might get time later to catch up. 1. A lovely couple in for a wedding today. 2. A scam letter that I am on the ball enough to see is just that but my word it's quite convincing if you were susceptible to that sort of thing! Frightening how authentic they seem to anyone on their own. 3. We didn't feel the four earthquakes right beneath us reported over the last few days! Fracking is on a knife edge! If they get worse they won't let it carry on. Love the top left shot! I try and walk at least 6,000 steps a day Pat - it's sometimes a lot more, and sometimes a lot less but averages out I think! @lyndamcg Same here Lynda, I did over 10,00 on Thursday but only 23000 yesterday. 7893 roads so far but I know tomorriw the wood burner will be on & I won't do many at all. I try & keep similar to you just to keep moving, mustn't get lazy! No excuse this fab weather! 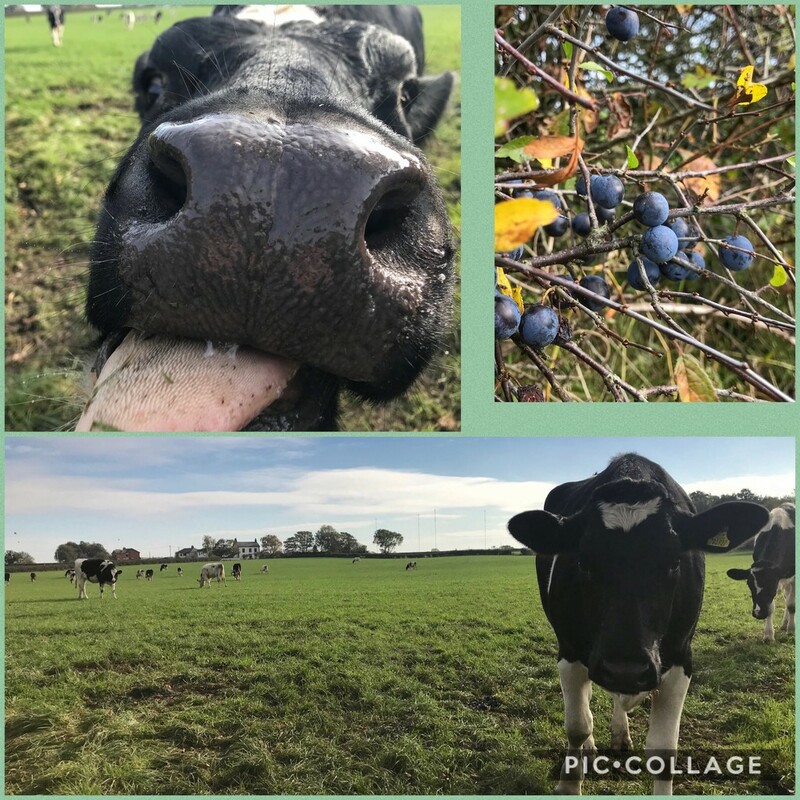 Looks like you would of got cow slobber on you screen.. Cant help dither the berries.. I would of said blueberries.. pleased to hear you didn't se d your bank account # to get a long lost Unckes money out of Nigeria.. I agree with Julia! @julzmaioro That nose is normally so wet! I do the same - park the car a few blocks away from where I need to go. Good to know about sloes! I often back out of web pages when they ask for your phone number too! That really made me laugh - looks like your camera came in for a wash!! I would say sloe berries, yes. People tell me we get them in northern Scotland, but I've never seen them here. Super fun collage of your walk. love the first shot...so fun! Love that nose, did make me chuckle. I love that cow kissing your camera! Love the top left and I’m pretty sure they’re sloes. Love the top left! Great shot! !